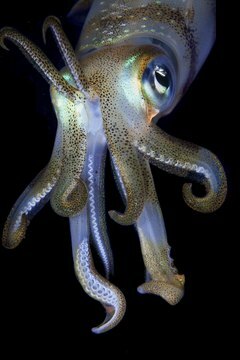 For many people the word squid conjures up images of tasty calamari rings, but a live squid can make an interesting pet. Squid are sensitive to water quality and have specific tank requirements as they are enthusiastic swimmers and have been known to jump out of tanks. This combined with the facts that they are relatively short-lived and are likely to eat any tank mates make them a challenging and exotic pet. There are dozens of different squid species. Pygmy squid are only around a half inch long while giant squid can be over 32 feet long. Smaller species only live for about six months, the majority of species live around 18 months, and even giant squids only live for three to five years, despite their size. This means they do not live as long as most fish species so it is good to know what species of squid you have so that you can look up its life expectancy. A large tank is best for squid as they like to swim quickly. The seawater temperature should be between 50 and 65 degrees; the water should be well-oxygenated and circulated to form a current. The bottom of the tank should have enough depth of sand for the squid to be able to hide himself in. Rocks or aquarium decorations also will give him places to hide. The tank needs a fitted lid or squid can get out. Always try to provide live food for your squid. They will eat shrimp, small fish and marine invertebrates. You only need to provide food two or three times a week. Remember an immature squid will need more food as it grows, and they grow quickly. Make sure the live prey is no more than one and a half times the length of the squid, as larger fish could be able to eat the squid. Clean the squid tank every two weeks. Use a net to catch the squid and place him in a bucket of water taken from the tank. Make sure you cover the top of the bucket. Drain the tank and scrub the sides thoroughly before refilling the tank with fresh saltwater. Make sure it is at the correct temperature before returning the squid. Replace the sand periodically when you see fine particles of dirt swirl around as the squid buries himself or about every two to three months.